Today I'm writing from the Hotel Flora in Prato, Italy. On 4 January my wife and I left Australia for Italy to undertake a one month international study intensive called "Dante's Medieval World" with Monash University. The course, which uses Dante's Divine Comedy as a starting point for studying medieval Italy, is being taught out of the Monash Centre in Prato, a small but beautiful centre occupying one level of the Palazzo Vaj. Aside from regular lectures, tutorials and reading groups, there are numerous site visits and day trips. 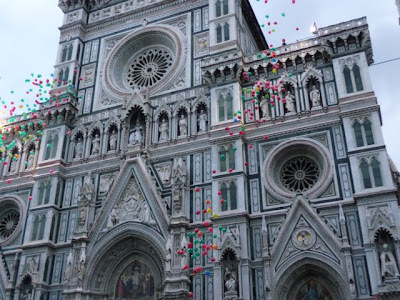 We have been to Florence and Pisa, and we still have day trips to Arezzo, Bologna, Lucca, Siena, and San Gimignano to come. 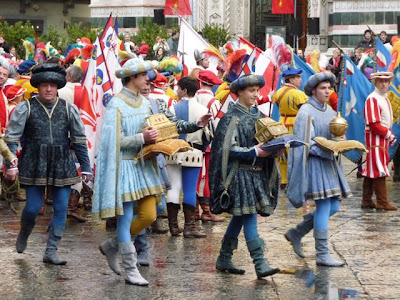 One of the most amazing experiences thus far has been witnessing the Procession of the Magi - the traditional Florentine celebrations of the Epiphany. 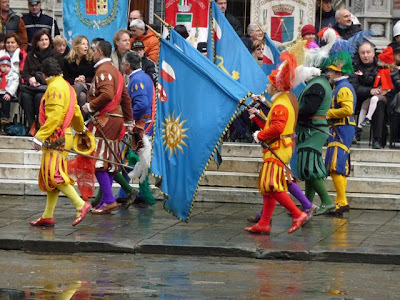 Hundreds of people dressed in the most amazing colours and marched around the streets of Florence, finally arriving at the Duomo (where we were). There was sword fighting, a nativity, a choir, the procession, a message from the Bishop, and lots of balloons.